For a long time now, these have been my fave brownies. They are delicious and they are gorgeous! They are my go-to treat to share. My work had a March Madness potluck and I (of course!) signed up to bring something sweet. I'd planned to bring the cheesecake brownies, but wound up deciding peanut butter was needed. 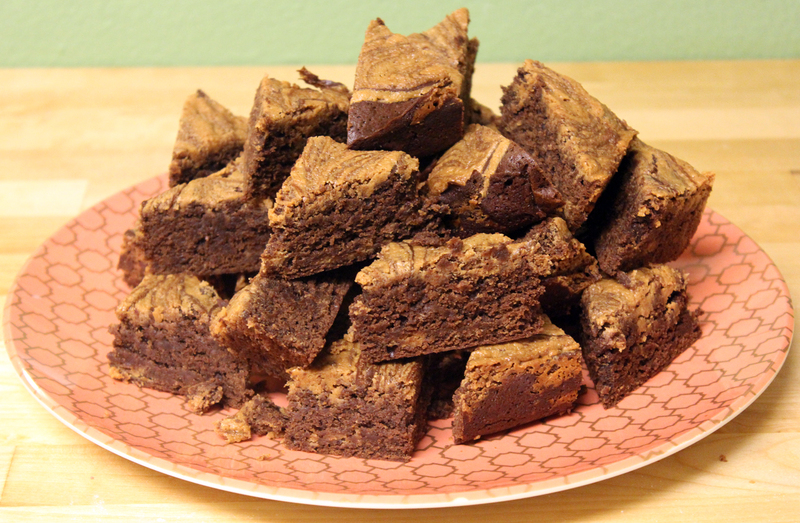 A bit of googling lead me to Martha Stewart's peanut butter swirl brownies. I changed things up only a tiny bit (more on that later) and these are just as wonderful as the cheesecake brownies. I officially have two fave brownies. Grease an 8 inch square baking dish, line with parchment and grease the bottom only of the parchment. In a double boiler (or a bowl over a pan of simmering water) melt the butter and the chocolates stirring occasionally. When the chocolate is all melted, let the mixture cool a bit. 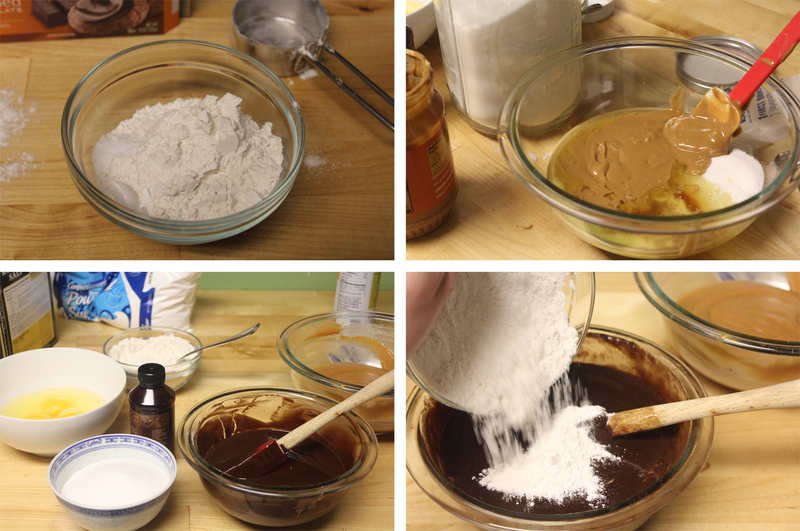 While the chocolate cools, in a separate bowl whisk together the flour, salt and baking powder. Next, mix together the peanut butter filling ingredients in a small bowl and set aside. To finish up the chocolate batter, whisk the sugar into the melted chocolate. Add the eggs and mix well. Stir in the vanilla and last, stir in the flour until well combined. Pour half of the chocolate batter into the greased baking pan. Dollop over half of the peanut butter mixture. Pour over the rest of the chocolate mixture and then finish dolloping over the peanut butter mixture. With a butter knife, cut through all of the layers and drag down one side of the pan. Continue this pattern along the whole pan, and then switch directions 90 degrees and drag the pattern across the batter the other direction. Cool completely and then chill before cutting. With the parchment overhang, you can lift the brownies out really easily. 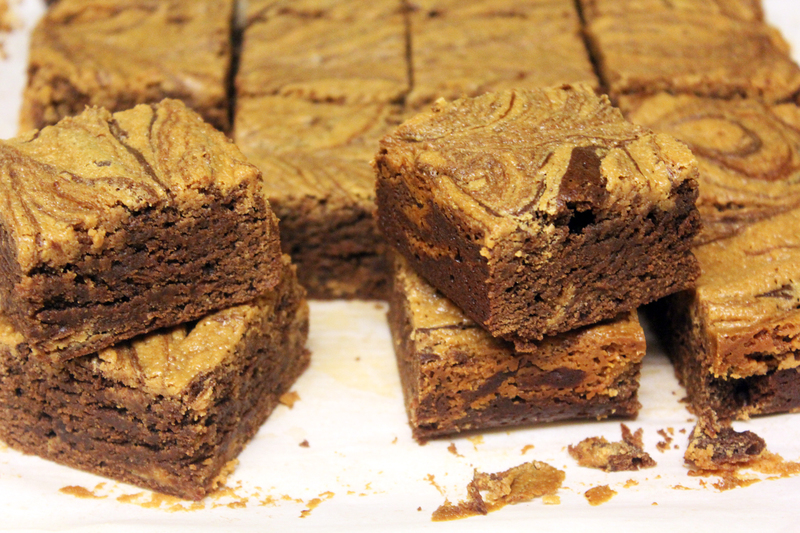 If you chill completely, the cut brownies will have clean, nice edges. Good example. Hurried example. The original recipe calls for powered sugar in the peanut butter mixture. I made a mistake and while I had even measured out the powered sugar, I ended up adding granulated sugar. I think this make for a plenty thick peanut butter layer that was very swirl-able. Something thicker would be really hard to swirl! The double boiler method of melting the chocolate is fussy. Next time I make these, I will just melt the chocolate and butter in a saucepan over very low heat. I will use the saucepan as my mixing bowl and save a dish. Turns out today is National Peanut Butter and Jelly day. Glad I could cover the PB at least!